Road racing CB160/175 Honda motorcycles has been around the Northwest for more than 20 years now. One of the stalwarts and very early participants in this class has been Tim Fowler, not to be confused with Tim O'Mahony in our profile below. Later on, the Seattle area racers became loosely known as Group W Racing and the movement grew quite well. The Portland area CB160/175 racers started a bit later and use the moniker The Flying Circus. There are some great rivalries within these groups although there has never been a race with most of the racers from both areas. Some Seattle area riders venture to the Portland area to race and some Portland area riders visit the Seattle area. The largest contingent usually is during the Vintage Day races with some racers coming from as far away as California. My first motorcycle road race was in 1982 with the American Road Racing Association at Willow Springs, so I have been road racing on and off for 26 years. Bevelheads.org, a group dedicated to the restoration and preservation of Ducati bevel drive singles and twins. They are the only reason I was able to restore my 1978 Ducati SD900 Darmah. Parts and advice are hard to come by when there you are working on a bike of which only 24 copies were imported to the US in '78. Without the BevelHeads and the internet, it would have been impossible! What is your current racing motorcycle/s? My current race bike is a 1971 CL175 based 160 Vintage racer. It is a constantly evolving bike, always looking for creative ways to make more power. Currently producing a whopping 18.28 hp on the dyno! 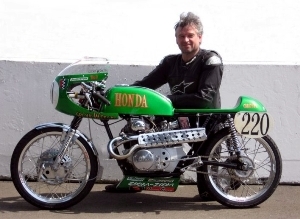 Did you have a/some previous racing motorcycle/s? Kawasaki GPz 305 production racer, Honda 1971 CB500 Vintage racer, 1971, Bultaco Pursang/Astro 250 vintage flat tracker, 1978 Bultaco Astro 250 flat tracker (former Mickey Fay bike). What tracks have you raced on? Willow Springs, Pacific Raceway, Portland International Raceway, Spokane Raceway Park. What is your most memorable racing experience (good or bad)? Probably the 2007 University Honda 160 Vintage Superbike Shootout. It was actually my first win on a road racer (after 25 years of trying!). I got an ok start, and managed to get into a great dice with one of the Portland hotshots, Eirik Nielsen. We traded the lead back and forth in almost every corner! On about the 5th lap or so, we were headed down the hill to Turn 3, and I got inside of Eirik. I decided I would hold the throttle open to the last second, just to let him hear the exhaust. I knew I couldn't pass him up the inside of 3, because he was so much faster than I was through that turn. But I wanted him to think I was going to try... I held the throttle to the last possible moment...then waited a moment longer. We both grabbed the brakes at the same time, and my brake lever came all the way to the bar! I wasn't scrubbing enough speed and didn't think I could hold my line, but I just held my breath and leaned it over. We were literally touching each other mid corner at full lean, sliding, WOW!!!! Eirik was outside getting close to the marbles, and suddenly he was down! Fortunately he signaled to me on the next lap that he was OK, with a thumbs up. At that point, I had such a big lead over 2nd place that I was able to cruise to my first win. What a day! Why do you like racing? Well, it sounds a little clich�, but the Steve McQueen quote "Racing is life, everything else is waiting" really sums it all up for me. When I am on the track, time stands still. I am not a 47 year old has-been...I am a 12 year old on my Schwinn Stingray, racing the wind. I am truly alive in that moment. The world stops and all that matters is the bike and the line. I am more focused and alive in those few minutes on the track than most people will ever be in their entire lives. I absolutely LOVE it! I doubt that I would ever be any good trying to race a real motorcycle, but on our little vintage "mini-bikes," I don't do too badly. I have always been a momentum rider, which is what Vintage 160 racing is all about. And for 20 laps or so every race weekend, I can believe I am really a racer. It is great! 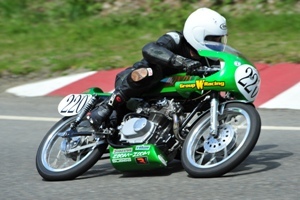 Tim ultimately won the 2008 160 Vintage class championship. The following is a message from him at the end of the season. "Frogmeister, I was thinking after our conversation that I am more proud of the lap record at Pacific than I am of winning the championship. Not that the championship wasn't cool, but a 1:56.65 lap was off the charts. I hope to break that again this season. The other day I heard someone boasting about a 1:53 on a 500 single. I thought .....Hmmmm.....with a few good days of practice, searching for the perfect lap...... ;-) TimO"